Apple, Google, and Samsung already offer mobile payments and LG gets ready to launch such a service in the near future as well. The market of mobile payments services has been growing rapidly in the last months, so it is no surprise that Apple, Google, and Samsung already grabbed a slice of it each. While some may say that LG is a bit late, the future could prove them wrong. That remains to be seen, since LG Pay is now only weeks (or days) away. According to a message by LG Mobile published on Facebook, the company has teamed up with Kookmin Card and Shinhan Card to launch this service. "It’s official! 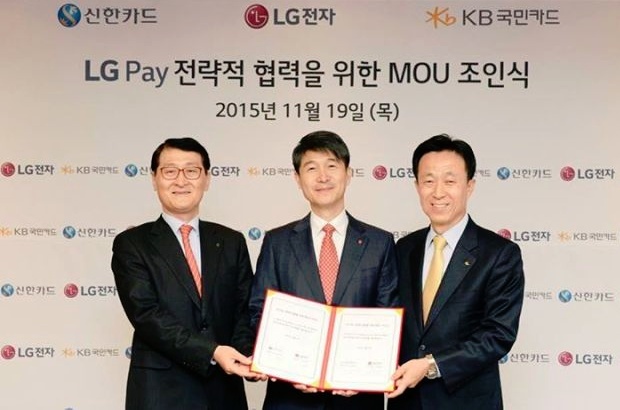 We have partnered with Shinhan Card and KB Kookmin Card to prepare for the launch of LG Pay," reads the message next to the picture of the three companies' CEOs. LG's partners are big names in South Korea, but they are virtually unknown in Europe or the United States. 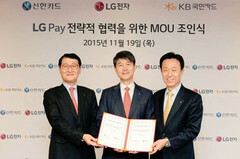 This means LG Pay will roll out in the company's home market first, and other markets will get it a few months later. More details will surely come out in the weeks to come, so stay tuned.